When a child takes a long time to learn a lesson, we call it a "slow learner". When mankind takes a long time to learn a lesson, we bypass responsibility and call it "history repeating itself". 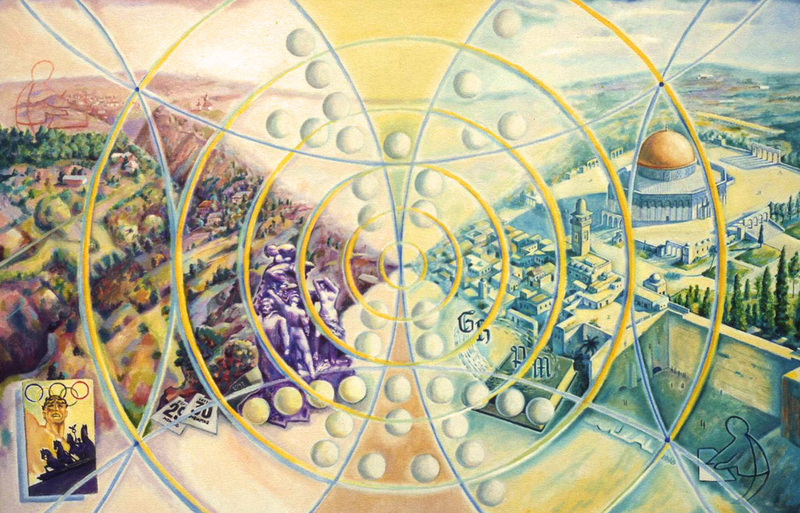 This painting is divided into two segments and illustrates the historical significance of the nation karma of Germany and Israel. The left side displays Babi Yar, a ravine outside of Kiev, Russia where thousands of Jewish civilians were eradicated in two days. The right side shows Jerusalem. Although it can take just one bullet to end a person's life, ironically 36 assassination attempts were made on Hitler's life. Incredible circumstances repeatedly caused these attacks to fail until the most powerful man in Europe was forced to take his own life on April 30, 1945. By that time, he had lived to experience his defeat and the end of World War II. The irony escalates with the report of Leo Heiman, an Israeli correspondent who documented that during the 1936 Olympic games in Berlin, Hitler had an affair with the German gold medalist javelin thrower, Tilly Fleischer. (Her image may be seen on the left side of the painting.) In her fifth month of pregnancy she was married off to Dr. Fritz Hosner. The child was named Gisela. Just as opposite magnetic poles attract each other, the young woman grew up and fell in love with Philippe Marvin, the son of a Jewish spiritual leader. Adamant in their affection to each other and despite the dismay and disapproval of her mother, they married and moved to Israel. "The Ultimate Irony" is that the man who put a lot of effort into the elimination of the Jewish people became the grandfather of Jewish children.